Mix Cubed/Diced potatoes in a mixing bowl with the olive oil, chili powder, and minced garlic. Spread out the potatoes on a large baking sheet tray and cook on 425F for about 45 Minutes (or until all potatoes are golden brown). While potatoes are cooking you can go ahead and make the sauce. In a small saucepan begin to heat the balsamic vinegar over a medium setting. While it is heating, dice up the apricots very finely. Add these to the vinegar and cook the balsamic down until the Apricots become soft and the mixture sweetens. As soon as it is finished you can fold it into the Yogurt. 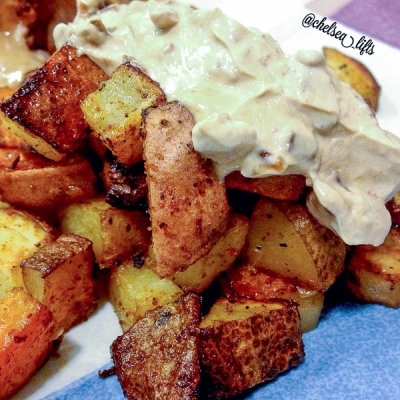 To serve, simply make a pile of the potatoes and top with the yogurt sauce!